Learn languages the easy 200 words a day! way. If you are not learning 200 words a day you are probably using outdated (. . . yawn. . .) methods. The Memory experts, people who memorise 40 decks of cards, tell us the easy way to remember things. . . Here try this. . . But we take away the (hard) work of visualizing a zany scene by giving it to you in cartoon form. So just imagine a lady has to GORE A couple of holes in a CAP to get it over the horns of her pet ANGORA goat. There is no easier way to learn languages! Why plod through the slow boredom of traditional methods to learn languages (… many of them computer based). . .
. . . leap ahead with the most effective, up-to-date, interactive learning techniques. It's fun, funny and fun-ominally easy. You can actually learn 300, 400 or 500 words a day or more . . . but let’s just take it slow, and aim for a mere 200 words a day. Hey, why burst a blood vessel? Relax, take a chill pill and smile your way through the learning process!
. . . you get all the tools, techniques and instructions to do it . . . fast. Even if you’ve never learned a language before. With minimal effort and in less than a week you can learn over 1,000 words of a foreign language. . . and, most importantly, you’ll be able to remember the words that lodge in your brain'slong term memory. The words and pictures just stick in your mind. •	Too busy to learn? . . . Not any more! Each lesson is only 5 to 12 minutes long, followed by a quick self-test, then check your learning rate in words-a-day which is automatically calculated after every test. To hit the 200 words a day target you only need to do, a 5-12 minute lesson per hour in a school day or average working day day. But of course you don't need to do 200 words a day, you can work at your own pace… and just do an hour a night. . . or an hour a week. You’ll still learn quicker and remember words over five to 20 times more effectively than traditional learning methods! •You'll find it fun and easy. When 9 years old my son Max (now 11) and his buddies ‘played’ the course as a game for fun, seeing who could remember the most words. (They don't even learn Spanish at his school...). We teach the word, then teach you HOW to remember each and every word …. •	We also use lots of famous people in the course... which makes many of the words and genders so easy to remember, and snap from your brain to the tip of your tongue. • The programme caters for different learning styles.... because we are all different. •	…Couldn’t sit still at school? You’re probably primarily a kinesthetic learner, and you learn by doing, touching, and by making. You're probably a practical person who can't watch someone droning at the blackboard as you sit in tortured silence. •	For you, just click to Kinesthetic mode. •	Or are you predominantly a visual learner who has to SEE information? Perfect for you as the visuals are fantastic. •	Or an auditory learner? Yup, all totally included. Every word has full sound, with different voices. •	We also give you tools to remember the genders of words, a real easy solution to an age old problem in language learning. It is 40 years since I studied French, so I am very much a novice again. I was dubious about getting anywhere near 200 words a day, but was amazed at how easy I passed 300 words a day. I was especially impressed about having a way to remember the genders. We didn't have those in my day at school. It makes it a lot easier. •	We give you three key techniques for every single noun! No more wondering whether the word you uttered came out feminine when it should have been masculine. •	We call them Gender Triggers © and they are simple and so effective that your gender recall will be 3 to 5 times better! than traditional learning methods. Again, I’ll expand on this later. . .
•	It is interactive and it tests you…. and keeps extensive records for you …. and the whole family or household! Research shows that testing on a subject improves learning effectiveness by over 50% . . . so extensive testing capability is incorporated. •	You will be listening to foreign dialogue only spoken by native speakers, so you will know how the language is really meant to sound. •	We incorporate the teachings of world renowned Superlearning guru Dr Georgi Lozanov from Bulgaria. Lozanov found that by getting students in to a relaxed state primed them for optimal learning performance. •	Two of the most important techniques Lozanov discovered to achieve the relaxed alert state of heightened awareness ideal for optimal learning, were. . .
•	…the use of specific relaxing music to ease the brainwave patterns in to an alpha state where new information most easily links in to the subconscious. •	The music is not just any music, but tends to be the largo movements of classical Baroque concerts. A mouse-click will give you tools for synchronised breathing, with our timed signals. With a mouse-click you can play special excelearning music which effortlessly soothes the mind into the peak learning state, when your mind can process information and put it in your long term memory . •	200 Words a Day! programmes remind you when review and re-testing is due. No longer do you have to plan revision (...then later forget about it). Research shows for most effective learning you should review learned material after a day, then again after a week, a month, 3 months and a year. We have a lesson by lesson prompt for you, reminding you when tests and reviewing is due. It is like having a friendly tutor there to remind you, and give you a little prod. •	Blitz your Worst Words! Words you score worst on go in to a separate lesson. You can then work on those until you get them right. When it comes to revision, save your precious time by concentrating on nuking your worst words. The list continually updates on a second by second basis, every time you do a self-test. The fact that it is multi-user, and the related tests on the words makes this an excellent course which all the family can enjoy and determine who is the most proficient. •	You’ll find the scoring generous and realistic. At school answers tended to be right or wrong. With most language courses it's much the same. Black and white. Either the answer is 100% right or (BLLEEEEEP) wrong! Well life is not like that, and we’ve structured the test scoring to reflect that, because in real life conversation if you get the noun right but the gender wrong listeners still know what you mean. So you get 0, 1, 2 or 3 out of 3 depending on how accurate you answer is. •	Also if you're struggling a bit, you can click for a clue, and the picture will appear to give the memory a little jog. •	Still stuck, you can get another clue before answering! •	… but if you get it wrong you can re-test yourself and the words you got wrong at the end of the test. •	You can also keep your own notes on each and every word that you learn, as can all the family, because the Home version of the programme accommodates 6 full users. The 200 Words-a-Day! programme keeps your notes separate for your continued private use – locked from prying eyes by a password of your choice. This means you can customise your course to your tastes! The cartoons and animations further assist the memory process, as does the humour and I am sure you will develop a love for your favourite ones.
. . . plus they are there as a ready reference whenever you want. There cannot be many simpler ways of learning than sitting down looking at drawings, cartoons, animations and gags! Sounds like DIS FRUIT AAHHH! So just imagine a boy lying on a sunbed, and saying "I am going TO ENJOY DIS FRUIT AAHH!" sound & audio and . . . Here, if you want to try some more click on these links and a new window will open for you with a few more examples. 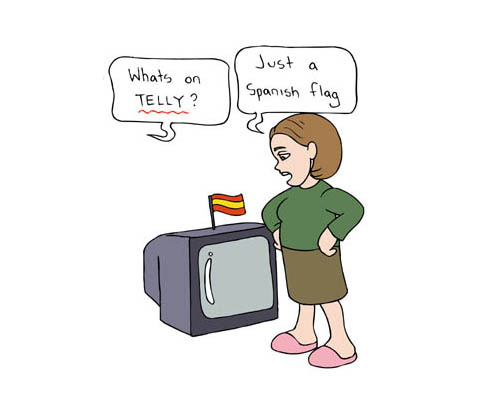 . .
>>>Click here for more Spanish examples. Learn languages fast. OR CHECK OUT SOME OF THE FRENCH EXAMPLES . . .
>>> Click here for more French examples ! There is more yet . . .
. . . especially if you want to tackle German . . . we'll give you the tools to . . .
. . . beat the previously unbeatable! Beat the German neuter trap! The Germans have a third gender - neuter. Unfortunately there is no hard and fast rule as to when or why a noun is neuter. For example a little girl - das Mädchen, is a neuter word, rather than feminine! Our course uses a highly effective tool for German neuter, one that we developed ourselves, and it is the . . .
. . . smoking animal. . . So for example the word for flour in German is . . .
(that sounds like das MAIL). we have a mule smoking a pipe preparing a MEAL, and pouring flour over a MEL-on with some MAIL beside him. .... the animal smoking in the picture reminds you that the word is neuter. You just study the picture and memorise as much detail and into the long term memory it goes. Given that there are lots of neuter words, our smoking animal tool gives us access to lots of animals who can either smoke pipes, cigars or cigarettes . . .
>>> Click for more German examples. ! We use Three ways to reinforce gender learning. •	We use female voices to read the feminine words and male voices to read the masculine words, further reinforcing gender recall. Easy, but no other course I have found, does it yet. I found going over words I got wrong to be very helpful, and it was far easier to remember the difference between male and female words when there was a corresponding voice reading the word. As mentioned earlier, we include an easy tool that enables you to synchronise your breathing in a way that experts say improves your learning. We call it 'excelearning' as your learning will 'excelerate'! •	Yogis, tai-chi and meditation experts all teach breathing techniques for relaxation and I can say that it really works. •	Experts in these fields will explain things like the ‘life force’ and ‘chakras’ etc. . .
•	. . . but, I believe that there is a further very simple reason why using the breathing function is so effective. With this function selected the programme signals you to breathe in, then signals you to hold your breath for a few seconds and then breathe out. What this does is clears your mind of all outside distractions, forcing you to concentrate on the new word being taught and its memory trigger and picture. The programme tracks your progress and tells you. . .
•	and what your rate of learning in words per day is! •	If you ever need to remind yourself of just one word that you forgot, or need to know, a comprehensive dictionary of all the words in the course is included. Just go to the dictionary and select the words you want to check out, whether from English to Foreign or Foreign to English. •	You can Build your own lesson as well, choosing the words that you want to have in your own lessons, that you can use yourself. •	Gives you comprehensive progress reports and testing records. Here are seven other things you should know. . . . . .
•	Each course covers over 1000 words. •	It is so easy to use – just keep pushing the Enter button and it will navigate you around the course in a logical sequence. •	You will cover the following important topics…. •	Travel Phrases, with handy travel words and phrases. •	Days, months, years, seasons, on the street, in the house, common verbs etc etc. When I prepared myself for starting to learn another language, I couldn't help but expect it to be difficult, not to mention boring. 200 Words A Day is surprisingly fun to use, and makes learning so much quicker. Gemma, Teacher trainee, Auckland, New Zealand. •	The 100 most common words comprise 50% of conversation . .
– Did you know that 50% of conversation revolves around the 100 most common words in any language. You’ll learn the 100 most common words in four short 25 word lessons in Course 1 of each language we teach. •	With 800 to 1000 words of vocab you can functionally operate in another language! The more vocab you build the quicker you can build your grammar and fluency. We also give you . . .
Techniques for foreign words that sound similar to the English word! •	We use the ‘official’ colours of the country in the scenario – black, yellow, red for German; red, white and blue for French; red, yellow and red for Spanish. •	…or we have a flag in the country’s colours, based on a concept developed by Paul Daniels, as illustrated above. (2) the flag tells us the word is similar to the English. And every word in the course has a picture to assist your long term memory and recall. I've now given you a pretty good run-down on what is in the course. There is more to it than I have covered, but the best way to prove it is to get your hands on the course and run through the lessons. Get it Now! Yes! I want to learn 200 Words a Day of a foreign language! " Get yours now! Check out our specials! CLICK HERE to get your 200 WORDS A DAY! CD-Rom COURSES. Call us any time for more information or just pick up the phone. We are only too happy to talk more about 200 Words a Day language learning technologies! Listen up, these techniques are easy and effective. 200 Words a Day is well within the grasp of an average person. A little bit of effort can see your rate of learning double or more. Learn languages the easy way. Transcity Properties Ltd, Company no 3845628 Registered in England, UK. Copyright 2004-2009. All Rights Reserved. 200 Words a Day and exceltra are trademarks of Transcity Properties Ltd.